The gallery space at The Drawing Room Boutique & Cafe in Cos Cob. Currently on display: Repetition, a show exploring the concepts of repetition and pattern. I've always wanted to own a small, personal and well curated collection of art. I've also always wanted a pied-a-terre in the 6th Arrondissement in which to house it. As I get (a little) older, I'm willing to admit my Paris apartment might not happen but am not willing to give up on that art collection. When I learned one of my favorite neighborhood spots, The Drawing Room Boutique & Cafe was opening an art gallery I was very excited. Since its opening a year ago, I've spent a lot of time "escaping" to the Drawing Room, browsing, planning and dreaming about that collection. When owners Kenleigh and Mike Larock decided expand their business to include a gallery they knew who to call: Kenleigh's sister Cameron Schmitz. An accomplished artist herself, Schmitz has a passion for art and artists equaled only by her humility. She's approachable, honest and knowledgeable. When I asked how she wished The Drawing Room Gallery to be viewed by the community, she's quick to point out that the gallery’s mission, (similar to the boutique's) is to create a warm and welcoming destination for people to find refuge, creative inspiration and a sense of community. Drawing Room owners Kenleigh & Mike Larock and gallery curator Cameron Schmitz stand in front of works from this summer's En Plein Air exhibition. Ever the opportunist, I was thrilled when Schmitz was willing to let me pick her brain about the ins & outs of art collecting, especially for beginners. As it turns out, knowing a lot about art isn't a prerequisite. Knowing and trusting yourself is. What types of things are you doing to make the Gallery open and welcome? I can't tell you how many art galleries I've walked into where the gallery assistant barely acknowledges my presence and makes me want to do a complete 180 right out the door. We want to create the opposite experience. We want our space to feel warm, cheerful and inviting, and to encourage visitors to slow down from their hurried pace of life, and wander and linger from the boutique, to the gallery to the café, as if facilitating their own personal journey. When a visitor walks through our doors, we treat them like they are a guest in our own home. Creating relationships is the most important element of all. We want every guest to feel comfortable asking questions and to feel they've left with something meaningful and lasting- whether that be a small gift, artwork for their own home, or knowledge and a deeper understanding about art and artists. How do you choose the theme for the regular exhibitions at the Gallery? Some themes, like our upcoming Drawing Show, are exhibits that I've had in the back of my mind for a long time. Sometimes the themes of our exhibitions are dictated by the artists who are making artwork worthy of note. I have a long list of artists whose work I have followed for many years and am constantly sourcing artwork and reviewing incoming gallery submissions on an ongoing basis. Part of the process is also listening to the feedback that we receive from visitors and customers. While it’s important to me that we promote both traditional and contemporary approaches to art making, including challenging works it’s equally important that the artwork that we exhibit strikes a chord with our audience. We balance making calculated risks while being cognizant of the fact that we are still a business. If the artwork is not received well and is not selling, we aren't supporting our artists, the gallery, nor our community effectively. When someone who is considering their first purchase of original art what type of guidance do you offer? Art is for everyone. Especially at The Drawing Room. My daughter and I recently stopped by to check out Repetition, which will be on display through November 12th. The two works behind my daughter are by Heidi Lewis Coleman. We want to get to the heart of what they're looking for and guide them in the right direction. The challenge with visual art is that it’s a visual language, and sometimes people can't fully articulate what they are actually looking for…often they can only clearly articulate what they don’t want. So we ask a lot of questions to reach a better understanding of their personal aesthetic, interests and style. We also have to make sure that we understand their budget, so when sourcing artwork for them, we present artwork that is accessible and comfortable on a financial level. We want to make sure that it’s a positive experience that they feel comfortable and excited about, not nervous and anxious. One unique aspect that complements this process is The Drawing Room’s Interior Design Services. When people redesign or decorate a space in their home, our design team holds their hand along the way and helps them envision different options in their home. 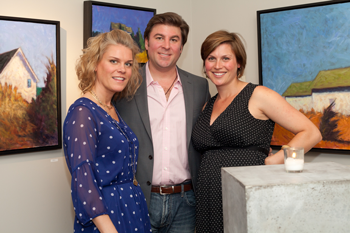 Through this process, the gallery works one-on-one with our design clients and presents artwork to them in their home. This can make the process of purchasing artwork much less nerve-wracking because the client can actually see the artwork in a particular space, as opposed to struggling to visualize what it might look like with their fingers crossed. Not everyone’s a visual person, so it’s our job to help him or her visualize how a new work of art can positively impact a space. What missteps do budding, first-time buyers often make? My biggest piece of advice is to stick to your guns and listen to your own instinct. Sometimes when people are seriously considering purchasing a work of art, they make the mistake of asking everyone and their mother over to their house to find out what they think. By the end of this experience, they end up feeling confused, frustrated, unsatisfied and self-conscious with their own ability to make a decision. If you have the opportunity to take artwork home for a trial period, I advise people to sit with it, live with it and talk about it with your partner and household members. Do you remember your first major art purchase? The purchases that I have made have been thrilling on a personal level, and quite honestly, have actually occurred when I probably had the smallest budget to purchase art, and probably should not have been spending my money on art in that particular moment in my life! My first original art purchase was when I was right out of grad school. I fell in love with this little 9x12 landscape painting by a Russian artist named Zufar Bikbov. I loved the painting so much, but could not afford it, so I contacted him and asked him if I could put a deposit on it, and pay for it over the course of few months. He was so nice about it and enthusiastically agreed. I did the same thing with a couple of Steven P. Goodman paintings. I couldn't decide between two, so I bought them both! Other works in our home collection is a painting by Helen Schulman, a couple small monotypes by Stuart Shils, a photograph by International Japanese artist, Izuru Mizutani, and this past winter, my husband and I purchased a beautiful etching by Robert Wainwright at a silent auction. It’s really exciting when local artists give artist talks and lectures at the gallery, which opens many doors to new and meaningful connections between artists and art enthusiasts in our community. Are there any budding or newly discovered artists that you are excited about? I'm really excited about all of our exhibiting artists, and there are too many to name that are making really unique, authentic work that deserve attention. However, if I were to name a few…Michele Kishita is an emerging artist out of Philadelphia that I discovered in 2012, whose work is really taking off. She’s one of those artists who continues to push the envelope and stretch the limits within of her own repertoire, never letting herself become stagnant in her practice. Duncan Johnson is another artist who's really beginning to make a name for himself in the art world and has received a lot of well-deserved press and attention recently. 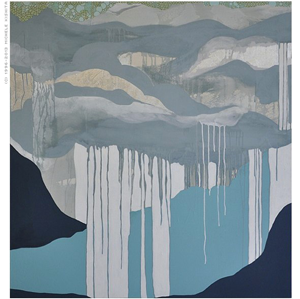 I stumbled upon his work in early 2012 when acting as an art consultant for a gallery in Vermont and sourcing artwork for one of Kenleigh’s design clients. Duncan’s paintings are made from all reclaimed wood, which is a really interesting and significant component in the work. He too is an artist that continues to push himself artistically, and I think, is on his way to becoming a fully established, highly regarded artist. On Cameron's to-do list: The Käthe Kollwitz museum in Berlin, Germany. I recently visited the studio of Rick Shaefer, a local artist working out of Bridgeport, CT at The Nest Arts Factory. He creates these amazing, monumental charcoal drawings on Mylar, which take your breath away. From afar they can appear like incredibly detailed and realistically drawn images, but when you get up close, the drawing dissolves into loose gestural strokes and marks in such unique and surprising ways. I'm excited to include his work in our upcoming Drawing Show, opening November 16. Finally, If you could hop a plane tomorrow and visit any ONE museum, gallery or cultural center anywhere in the world, which one would it be? Good question! That difficult! Knowing that I’ve checked some major museums off my bucket list that were located in Italy, France, and England, I have to say that my next stop would be Berlin, Germany, at the Käthe Kallowitz Museum, which is a relatively new, small private museum housed in a former private residence in Berlin. Since my undergraduate days as an art student, I have admired Kathe Kollowitz as a printmaker and her emotional and heart-wrench imagery, and I would love to be able to experience the full breadth of her work. Located at 5 Suburban Ave in Cos Cob, CT, The Drawing Room Boutique & Cafe is truly unique. Its relaxing, yet energizing. My theory is that they've achieved this by having a well curated and well thought out space. More and more I've come to realize that I really appreciate visiting smaller art museums with a specific focus and depth on a few particular artists. Huge museums like the Louvre are absolutely amazing to visit, but can also make me feel a little too excited and anxious about seeing it all, which prevents me from being able to really sit with particular artworks for extended periods of time, like they deserve. I never have enough energy, and more importantly the mental and emotional capacity to absorb it all. There’s a kind of intimacy and soulful feeling that you get in smaller museums, which also don’t get so caught up in Blockbuster exhibitions, but rather, really shed light on the life of an artist, and how those artists elevated society and made a positive impact on humanity. Thank you Cameron! I'm inspired! You can visit the Drawing Room Boutique and Gallery Monday-Saturday 10-5. The Cafe opens at 8:00.